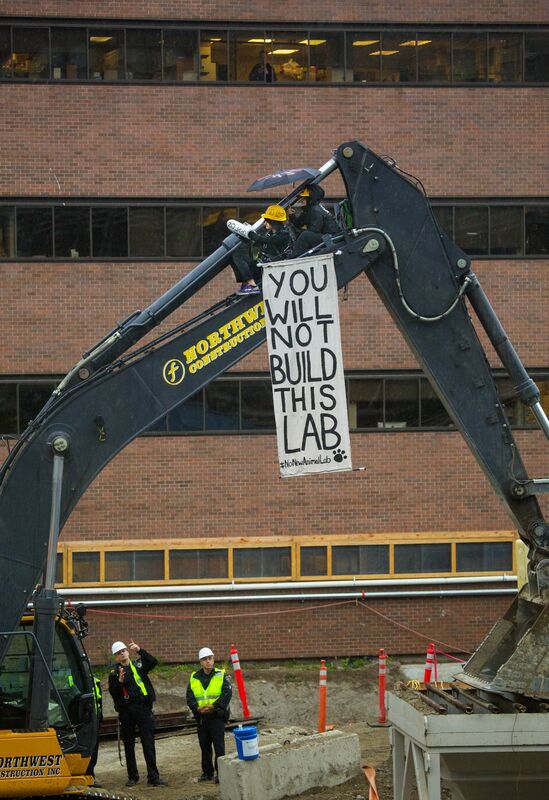 Two activists sat on an excavator at the construction site of an animal-research lab at the University of Washington for much of Monday. One was chained to the machine. Update at 6 p.m.: The two activists who sat on the excavator at the UW animal-research lab construction site agreed to leave the site around 5 p.m., after the Seattle Fire Department assisted in a safe evacuation. Both activists will be booked into the King County Jail on suspicion of criminal sabotage, according to a UW statement. Update at 2:30 p.m.: The activists are still up there. “We’re still having a conversation with them and encouraging them to come down,” UW police chief John Vinson said. He said there are not plans to remove the two against their will. “We are still attempting to engage in dialogue with them and hoping for a peaceful resolution,” Vinson said. 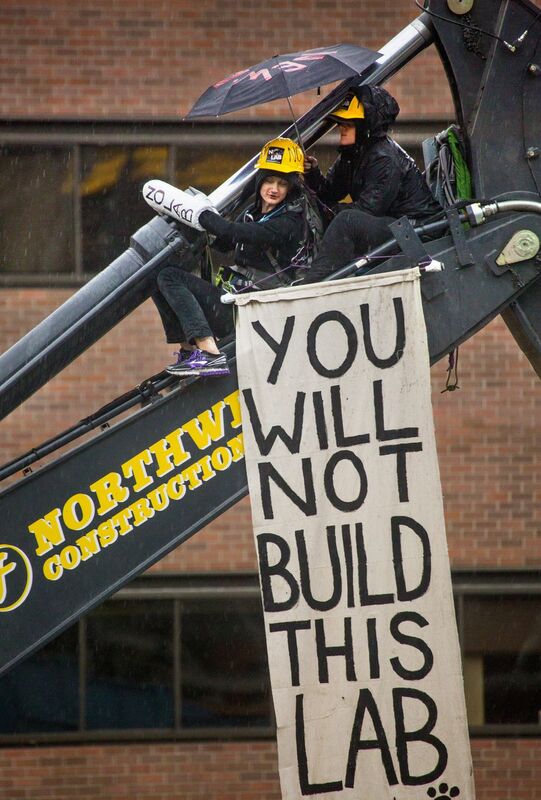 Original Post: Two activists are sitting on an excavator at the construction site of an animal-research lab at the University of Washington. One is chained to the machine. “They plan to stay posted up as long as possible to stop work,” said Justin Kay, a spokesman for the activists. Police are at the scene, but no action has been taken. 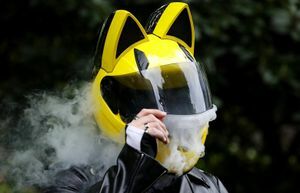 The university is “attempting to establish a conversation to figure out what they’re looking for,” said Norman Arkans, a UW spokesman. “We have two people who have secured themselves to a piece of construction equipment, and they can’t stay there. Our primary interest is their safety because they’re in a precarious position,” Arkans said. “They are trespassing,” said John Vinson, UW police chief. 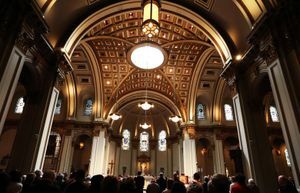 “At this point, all options are being considered” for bringing the protesters down, Vinson said. Most people involved in the protests are not students, and No New Animal Lab is a campaign, rather than a specific group, said organizer Amanda Schemkes in an earlier story. Arkans said he understands people feel passionate about the issue of animal testing. But “at some point, you have to test what you’re doing on a complex organism,” he said. “We have a whole lot of people doing good work to further human health,” Arkans said.